New information as of July 9, 2008: The New York Times published an explosive exposé detailing how the Association of Community Organizations for Reform Now (ACORN) covered up nearly $1 million in embezzled funds by its founder’s brother. 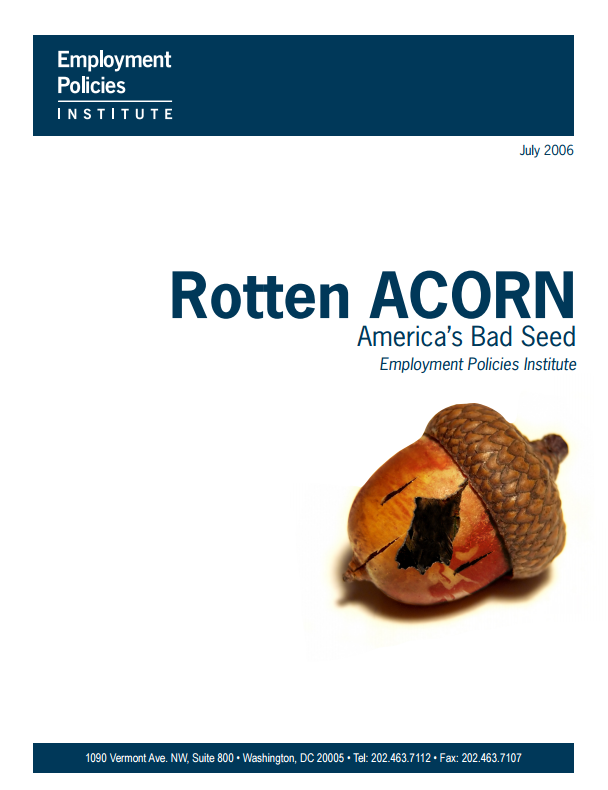 Read our statement about ACORN’s long history of fraud and corruption. ACORN says it is a community group, but it is really a multi-million-dollar, multinational conglomerate. Its political agenda is driven by a relative handful of anti-corporate activists. ACORN spends millions of dollars to promote economic policies (like raising the minimum wage), but has admitted that it doesn't always want to abide by them. ACORN advocates for workers' rights and runs two unions, but has in the past fought its own employees' efforts to form a union. ACORN's history makes for pretty interesting reading. The Clinton Administration found that ACORN was misspending government grants designed to help counsel the poor. Although it seeks minimum wage increases in cities and states across the country -- ACORN sued the state of California to get out of paying its own employees the state minimum wage. ACORN's practices have corrupted our political process as well. It has engaged in questionable election activities for years—stretching back even to the organization's founding years in Arkansas. In recent years, as its political power has increased, so have instances of fraud. In the past few years, it has been investigated for election fraud in at least a dozen states. Want examples? In Florida, ACORN employees filed a false voter registration form for 68-year-old former St. Petersburg Democratic mayor Charles Schuh – amazingly, they registered him as a 30-year-old Republican woman. In Ohio, ACORN and its affiliate Project Vote submitted registration cards that had the highest rate of errors for any voter registration group. In Colorado, two ex-ACORN employees were convicted of turning in false registrations. The list goes on. In 2005, in an effort to put a wage initiative on the ballot in Albuquerque, New Mexico, ACORN employees forged thousands of fraudulent signatures. The group was involved in initiative efforts in a half-dozen states and continues to defend against a long list of charges of voter fraud and corruption.